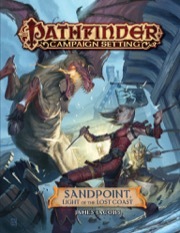 Pathfinder Campaign Setting: Sandpoint, Light of the Lost Coast is intended for use with the Pathfinder campaign setting, but it can be easily adapted to any fantasy world. Note: The fugitive adhesive holding the map to the back of the book can be quite robust. Use care when removing the map from the book or fugitive adhesive from the map so as not to tear the map. Mixed Review for this product. - The town of Sandpoint itself comes alive and is nearly fully fleshed out. - There are interesting quests of varied levels linked to nearly every keyed location. - As the book progresses, things become more and more politically correct. - Certain locations are not nearly fleshed out enough, with limited maps and only a general description given. IMO, it would have been better to mention fewer of these locations, but those you DO mention get fully fleshed out. - Characters espousing "conservative" values are evil, while those espousing American far-left values are represented as being good. This isn't "diversity" "inclusivity" and "tolerance". Instead, it's a specific political agenda being pushed and only certain types of individuals are welcome. All others are either absent or evil. - The Hinterlands become a "throw spaghetti on the wall" kind of place. With all of these evil creatures in such a small space (a region roughly the size of San Francisco), it's amazing they don't either team up or destroy one another. It detracts from the verisimilitude of the product and area. Just...too much. All-in-all, a weird product. There is a lot of good here, and a lot of bad. If you are ultra-liberal and can easily suspend disbelief, you'll likely enjoy this. For everyone else, if you can tolerate the at times gag-inducing political correctness and don't mind a lack of verisimilitude, there are bits and pieces of greatness here to pick from. Yes, it really is ALL here! I've read the threads and the other reviews, and many suggest that there is so much material in this book, one could do an entire adventure in Sandpoint alone! Well, actually, it's 100% true. How do I know? I was in one. THE ONE. I had the extremely good fortune of being one of the players in James's The Shadow Under Sandpoint . All the things detailed in this book...they were there. The Old Light? Yes. Chopper's Rock, and the ghost of Jervis Stoot? OH YES. Paupers' Graves? Yep! Even Goblin Squash Stables and Hosk's big pickled goblin in a jar (first thing I looked for, actually). The Pixie's Kitten? Ah, er...um...yes. And all the characters, from Ameiko to Pillbug Pokider, Kanker (damn him), the Red Bishop. Plus MORE. There are lots of people and places that are even new to me (and some that I really wish we could have interacted with now that I see them!). I am thrilled to get to read this, and I am equally thrilled that everyone else does now too! To have James pull back the curtain on such a great setting has been a real treat for me. Reading through the book has brought a smile to my face as I remember some wonderful roleplaying moments that I will treasure forever. I hope that the content of this book provides all of you with similar roleplaying experiences in the years to come. THANK YOU, JAMES. The first order I ever placed with Paizo was for Pathfinder Chronicles: Guide to Korvosa. It immediately went to the top of my list of “gazetteer products” produced for any system and has remained there until this week, when I received Sandpoint – Light of the Lost Coast. This book is an absolute gem. I struggle to find anything critical to say about it. There is a great poster map – the town on one side and the surrounding countryside on the other. There’s also a brilliant two-page illustration showing the town which will prove a godsend for helping players “get” the local geography (I hope this becomes a regular feature, going forward). This focus on usability at the game table really shines through every page of the book. There are fifty two places of interest detailed within the town. In addition to the purpose/function of each location, they all come complete with an NPC, a rumor and a plot hook (generally tied to the NPC’s rumor). The whole book is structured to help the DM really make the place feel real to the players. There are plenty of adventure sites sketched out – not enough to run an adventure out of the book but plenty to get you started creatively. Reading it feels like you could take PCs from 1st level all the way through to their teens without ever leaving the town. The adventure sites are all set securely within the history of the town – a brilliantly balanced plot hook that gives you enough that the players won’t know what’s yours and what’s “official” yet leaves plenty of scope to build exactly the adventures your group likes. Although brief, the section on the Sandpoint Hinterlands really stood out to me. The “areas of interest nearby” sections of town/city RPG books are rarely very good, in my experience. They generally feel tacked on and incomplete. In this case, the care the author took in the first sections is still very much in evidence. It seems like no matter what bits of the setting pique my PCs’ attention, there’ll be plenty there to help me keep them entertained. It’s difficult to articulate exactly why this book stands out to me, but I’ve been buying “campaign starting points” since Village of Hommlet and I can honestly say this is the best one I’ve ever seen. It’s my new favourite Paizo town/city book (and I suspect it’s going to take another ten years to dislodge it). Mr Jacobs did a fantastic job detailing the iconic town of Golarion. If you want to use it with the original Rise of the Runelords the current Return of the Runelords or in your own home-brew game you will have more then enough details for anything you want to do. Fully fleshed out NPC's area details, adventure hooks and rumors all included for various levels of play. Amazing amount of detail on every location in Sandpoint (down to their street address). Lots of NPC statblocks and quest ideas for each establishment is great. Also includes a lot of info for the hinterlands around the town. AND an amazing 2-sided map of Sandpoint and the Hinterlands. Huh! This one snuck up on me. It amuses me that many nations are detailed in a single book, and this sleepy coastal town gets an entire book of its own. Not complaining at all, though. Just made me chuckle a bit. I suppose this will reprint Sheriff's and Father Zantus' statblocks from the comic book bonus article and include same info on Rusty Dragon as comic book articles? This has been a long time coming! Sounds terrific - I’m really glad you went with an expanded book and included both maps. More books from James Jacobs (I presume) are always welcome. Ooh! I didn't even notice the expanded page count. Pretty cool! 96 pages. Sweet! And probably very light on rules, which is good. Also, likely the reason why the Rusty Dragon wasn't in Inner Sea Taverns. Ooooh yes, back where it all began and now we'll finally learn who in secret is a veiled master! I bet it's Shayliss Vinder. This is AWESOME!! And it's 96 pages, too! Will be waiting in great anticipation. Thank you to all those involved in making it a reality - especially James Jacobs. Yes it will. In fact, I'm going to be including stat blocks for EVERY NPC of note in town. And yes, I'm writing the whole book. I've got a week or so left on finishing it up so now is a great time for folks to drop in requests and suggestions and hopes and fears for me to take into account! Beyond there being stat blocks for all the NPCs and villains of note, there'll be some new things here and there (mostly in the form of new items or spells or monsters unique to the area), but it's not intended to be a player's book. It's VERY focused toward the GM who wants to run a Sandpoint campaign (it will have elements of "build your own campaign using this book as a sandbox workshop") and to folks who just want to know more about Sandpoint. Including the reason why it's had so much trouble lately. And yes, this is the reason the Rusty Dragon wasn't in Inner Sea Taverns. I can reveal that now. No one in Sandpoint is secretly a veiled master. Note that is NOT the same as saying "No one in Sandpoint is a monster disguised as a human," nor is it "The aboleths have no presence in the Sandpoint region." And to reiterate: I'm still finishing this up, so if anyone has any hopes and ideas and suggestions for what to include in what's more or less gonna be a big sandbox setting/96-page gazetteer of a town and its Hinterlands... now's the time to speak up! I'll be here watching and reading and occasionally commenting. Umm... Well assuming book details what happened after Ameiko left Sandpoint, would be nice to know how Rusty Dragon is nowadays doing. Would in general nice to have expansion on stuff from RotR, Jade Regent article and bonus article. Like, I'd like to have details on ghost of the Chopper and what is on Chopper's Island and also about Valdermar family's... Situation. Besides that uh, there are lot of interesting areas in Hinterlands I'm interesting in knowing stuff about, like Devil's Platter, Red Bishop and the Tors. Also, since book seems to assume RotR happened, I want to hear what happened to Scarnetti family since players had pretty good chance of exposing their arson scheme and getting them jailed as result :D Maybe would be nice to also know what happened to exorcised Foxglove Manor, like did Aldern's sisters take it over? How about Thistletop, now that Malfeshnekor is dead, has it become archeology site or is it just there abandoned? The book is set in the time between Rise of the Runelords and Jade Regent. Ameiko is still in town. That said, I do talk a little bit about what happens to her manor and the Rusty Dragon once she leaves town for Jade Regent. The book assumes Rise of the Runelords has happened, but that's pretty much the only assumption. There's going to be LOTS more info on Chopper, his island, the Valdemar situation, Devil's Platter, the Red Bishop, and the Tors. Foxglove Manor is now just an empty house that's up for sale. Do your players want to buy it? The book will talk about the repercussions of that choice too, as well as how the PCs go about purchasing it. And the Scarnettis are still in power, but the assumption is that their arson scheme is still hidden—that was never a heavy plot point in an adventure and is one that could fuel part of a sandbox game in Sandpoint, a great example of one of dozens and dozens of plot threads and quests and rumors that'll be in the book for GMs to mine for adventure starters. There have been strong hints that something about this area is important in the conflict between Pazuzu and Lamashtu will we find Something out about that? :O My hype for the book is growing! And so are my questions! Come to think about it, what happens to Habe's Sanatorium? Does book assume he is still running it? And if book is before Jade Regent, is Koya Mvashti's mother Niska Mvashti still alive and gets stats and all? What happened to Catacombs of Wrath and Lamashtu's Shrine underneath Sandpoint after RotR? I guess not all characters from RotR's gazetteers can get stats since there are like 50 of them, but do they all get mentioned and how their life has been since goblin and giant attacks? 1) Will it turn out that Ilsoari Gandethus has dark secret in his academy's basement? In sandbox-y products, I always enjoy those little adventure seeds - kind of one or two paragraph summaries of a potential plot. Habe's Sanatorium is in the book and will reflect Habe's recent events from Runelords. Niska is still alive... for NOW. High level adventurers used magic to fix the sinkhole, but there are still dungeons below Sandpoint to explore. All of the characters get stats, save for a few who die between Runelords and now. Many of these characters are lower level commoners, experts, or aristocrats, and those will share a set of generic stats. But if a character is not human, is higher level than 3rd, or has a level in something other than commoner, aristocrat, or expert, they'll have their own stat block. Ilsoari's "secret" will likely be revealed, yes. Rynshinn's got a secret too, yes, and it'll be explored. Wisher's Well will have an entry, along with a stat block for Vorimorath and a few other things. Every location in Sandpoint and every location in the hinterlands will get its own specialized rumor and its own specialized quests. Some of these will overlap. Some locations will have more than one rumor or quest. And there'll be an entire chapter about "adventure seeds" and semi-fleshed-out plots to expand upon. THANKS for doing this for us Mr. Jacobs! Look forward to any and all input that you can give us on the going ons in and around Sandpoint! Been waiting years to see this and I think you will not disappoint the fans at ALL! Will be Birdcrunchers and Licktoads be there, and will the Goblins quadrology be incorporated? All of the local goblin tribes will have info, but the Goblins series likely won't be incorporated, since their story more or less kicks off in tandem with Jade Regent, which, again, is assumed to happen AFTER this book. Well, that’s better than what I was looking for. May I ask. How many NPC head arts? How many NPC full body arts? I would love to see a "fifty things the PCs might see in Sandpoint," like NPC A having an argument in the street with NPC B about Topic X, or NPC C's wagon having broken down, etc. Not major "adventure hooks," but just little bits of flavour to spice up an otherwise uneventful day of shopping or info gathering. Some times I'm really good at thinking on my feet for stuff like this, and other times . . . not so much. Dunno yet. I haven't written the art brief and no art has been ordered, but as a general rule I would like to have a piece of art on every spread. Subtracting out the first and last page gives us 47 spreads (94 pages), of which 3 will have half-page art openers for the 3 chapters, and I think 4 will have maps, leaving us 40 spreads to split between portrait-style illustrations and full body illustrations. Looking at that, I'd say that there'll PROBABLY be something like 15 portrait illustrations and 25 full body illustrations, but again... I haven't done the art brief yet and word counts will influence what happens where. That sounds really good. I totally understand it's a ballpark figure, but it still sounds really good. Looking forward to this. That's an interesting idea. I don't think I'll have room for many of these big lists though, alas. This is awesome. People have being asking for this pretty much since day 1. I'm glad that the stars aligned. Is Amaya appearing? Is Tsuto assumed to be dead? Ah, it would be very cool to have something like "10 things you learn growing up in Sandpoint" or maybe ideas to make PCs related to the npcs in town. I honestly don't need this in another format since the playtest won't be available until August, the Return of the Runelords will be in full swing when this become available, and quite honestly, I LOVE to see this in the format written. Amaya is not in Sandppoint. Tsuto is dead (as is his dad). Hmmm... the 10 things you learn growing up Sandpoint is a cool idea. Not sure there'll be room to include but I'll see what I can do. With the exception of the NPC/Villain stat blocks, this book is gonna be pretty much equally useful for you if you run 1st or 2nd edition Pathfinder. Or D&D or GURPS or Fantasy Hero or Runequest or Call of Cthulhu Dreamlands or Tunnels & Trolls or The Strange or whatever fantasy-genre RPG you prefer. This is awesome! Really looking forward to it. What I hope for in the book is a way for new GMs to take this book, plus the Beginner Box, and run lots of interesting adventures with just those two bits. And pawns for all the NPCs and monsters that aren't already included in the BB. And a card deck with NPC portraits that I can show to my players, and perhaps with their stat blocks on the back. I envision clipping the card to the top of my GM screen so that I can be behind a "mask" as I portray each NPC. The little town where it all began... awesome!